With the New Year comes a refreshed sense of purpose. It's time to tackle all of those items on the to-do list that have gathered dust over the past year. If you've never gotten around to creating a study area that's both attractive and functional, maybe it's time to get intentional about this important area of your living space. Here are a few suggestions from the uber-organized folks at the Container Store. Find the right study area and desk. Find a desk, table or other smooth surface with room to spread out all study materials. Select a chair that’s comfortable, but not too cozy. When selecting a workspace, choose a modular system that will grow with your child through high school and even into college. Make sure the room has adequate lighting. Limit the distractions. If possible, try to create a study area in a location without a telephone or television — these may be too tempting for even the most disciplined students. For older kids, implement a cell phone-free study zone to avoid distractions like text messaging. If you set up a study area in a high traffic area of the home, set aside a firm study time where everyone in the family respects the student’s time to study and finds things to do in other areas of the home. Create a schedule and filing system. At the beginning of the school year, create a scheduling system with a large monthly calendar and place it near the workspace. Color code the calendar items, such as homework and project due dates, exams and birthday parties, in order to easily identify school versus personal entries. This makes it easy for students to manage responsibilities and is also simple for mom and dad to check on the status of kids' projects. Create a color-coded filing system that works in conjunction with the schedule. Keep the area clutter-free. 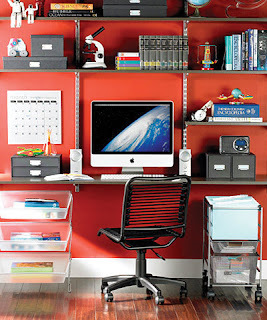 A cluttered study area is not only frustrating, but also will cost valuable study time looking for items. Make sure enough room is available to adequately store books and supplies where they are visible and easily accessible, yet out of the way of the main study area. Include room for writing as well as computing when setting up the space. Keep supplies on hand. It’s frustrating to sit down for a study session and then find out you don’t have the necessary materials. Stock up on the essentials, such as pens, pencils, notepaper, printer paper, ink cartridges, index cards, construction paper and scissors, then make sure they’re organized. Keep reference materials close at hand.